CPMS students present posters at DMU’s ninth annual Research Symposium. Robert Clements tested whether using plastinated specimens helps students identify anatomical structures on MRI scans. Kiera Benge-Shea investigated the surgical management of a rare congenital lower limb deformity. Donald McDonald examined methods to determine the cost-effectiveness of treatment options for plantar heel pain. And Edee Wildman compared metabolic bone markers, such as vitamin D and parathyroid hormone levels, between diabetic and nondiabetic populations. 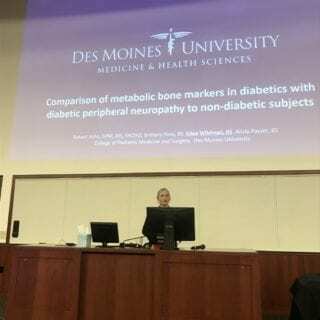 These individuals are among the 22 students in Des Moines University’s College of Podiatric Medicine and Surgery (CPMS) who presented their scientific works, in the form of 16 posters and one oral abstract, at the ninth annual DMU Research Symposium. Students from all four CPMS classes participated in the event. “Although our didactic and clinical schedules can be rigorous, I have always been drawn to activities that require a hands-on approach for problem-solving and personal development,” says Robert Clements, D.P.M.’20. Prior to enrolling in CPMS, he completed a master’s degree in DMU’s research-focused biomedical sciences program. “Through the M.S.B.S. curriculum, I discovered how fundamental research is for advancing our understanding of medicine and providing improved patient outcomes,” he says. That motivated him to pursue further research opportunities as a member and president of CPMS’s Student Chapter of the American College of Foot and Ankle Surgery. “The symposium provides an excellent opportunity for sharing research and receiving constructive feedback from students and faculty alike,” he says. Edee Wildman delivers her award-winning oral abstract. Wildman says she would strongly encourage first-year medical students to get involved in research, which she notes also is key to her future profession. Some of the CPMS students’ posters represented unique collaborations. Donald McDonald, D.P.M.’20, co-authored his research poster, “Cost-effectiveness of treatment for plantar heel pain,” with Shane McClinton, D.P.T., Ph.D., OCS, FAAOMPT, CSCS, associate professor of physical therapy at DMU. “It was especially rewarding to work with Dr. McClinton, exploring interprofessional care, knowing time spent in the lab might help shape the future of clinical podiatric medicine,” he says. The co-authors of the poster presented by Jeanne Mirbey, D.P.M.’19, included not only CPMS Dean Robert Yoho, D.P.M., M.S., FACFAS, Assistant Professor James Mahoney, D.P.M., FACFAS, and classmate Laura Tolentino, D.P.M.’19, but also her father, Joel Mirbey, M.D., an orthopedic surgeon in Dijon, France. He performed the surgeries for the cases presented in the poster, titled “Case study: single-stage lengthening osteotomy for brachymetatarsia for the fourth metatarsal.” She credits him for her interest in research and CPMS for letting her pursue it.